If the merger between these two falls through, there's only one side I want to be on. Sprint Corporation (NYSE:S) and T-Mobile (NASDAQ:TMUS) are very similar in a lot of ways. They're both national players in wireless communications, and both compete to be budget wireless providers -- compared to premium players AT&T and Verizon. As a result, they have generally generated lower margins than their larger rivals and lower profitability, which is why they have proposed merging. But the merger has been under regulatory pressure, as it would leave the U.S. with only three major wireless networks and it's possible none of them would offer low-cost plans. If the merger falls through, which side of these two wireless companies do investors want to be on? Between T-Mobile and Sprint, the better pick may not be as difficult to identify as it may seem. The wireless business is all about generating the most revenue from the very high capital expenditures required to build a network. 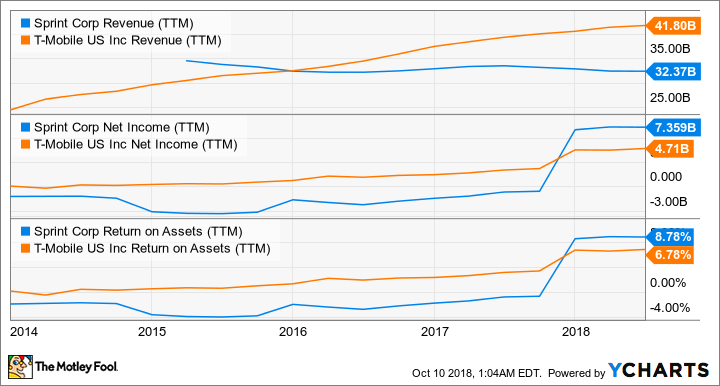 You can see below that T-Mobile has done better generating value from its network by growing more quickly, generating higher return on assets, and having higher net income than Sprint, except for the one-time gains both companies took from the tax cut passed late in 2017. The return on assets number is what I think investors should focus on in the telecommunications industry. This is a highly capital intensive business, and if companies can't make money from their investments long-term they won't be winners on the stock market. T-Mobile has clearly generated superior returns on assets over time compared to Sprint, and that shows no signs of stopping. There isn't a huge difference between wireless companies today, so a huge piece of their differentiation is branding. Under CEO John Legere, T-Mobile has become the scrappy young company fighting against the big, bad mobile giants like AT&T and Verizon. That's helped the company attract new customers and grow, which you can see above. Sprint, on the other hand, has tried to cut costs to improve profitability, but has been left with a shrinking business as customers have moved to T-Mobile. And in the telecommunications business, where investment is the name of the game, it's difficult to see how cutting costs will endear you to customers. Right or wrong, T-Mobile's brand is far better than Sprint's today. That's why it's the hotter company and the one leading the charge in budget wireless. If we look at valuation, T-Mobile still appears to come out on top. I mentioned above that the tax bill altered net income and therefore P/E ratios, but if we look at the two companies' price to sales and price to pre-tax earnings ratios T-Mobile only trades at a slight premium. I would take T-Mobile's superior growth, better margins, and similar valuation any day if the Sprint/T-Mobile merger falls through. What's great about owning T-Mobile's stock is that even if the deal does happen the company is well positioned for continued growth in a wireless business where power seems to be consolidating more by the day.